g CoatingsPro Spotlight 2013 g CoatingsPro Spotlight 2013 CoatingsPro Spotlight 2013 g CoatingsPro Spotlight 2013 CoatingsPro Spotlight 2013 Mascoat g g potlight 2013 Montipower g Montipower Phone: (877) 629-8777 www.mbxit.com Reader Inquiry #6225 Reader Inquiry #6226 CoatingsPro Spotlight 2013 Mascoat Phone: (713) 465-0304 • Fax: (713) 465-0302 www.mascoat.com g The MBX¨ Bristle Blaster is an innovative rotary bristle tool that removes corrosion, and generates an anchor profile in a single step. Light-weight, hand-held, pneumatic and electric tools feature in-line belts with specialized wire bristles that remove corrosion, mill scale, and coatings while imparting a 3 mil surface profile on steel surfaces. The rotating bristles tips strike the surface and rebound, restoring a white metal or near-white metal finish. Ideally suited for spot repairs, weld cleaning, and feathering into existing coatings, it can be readily applied to larger areas where alternative methods may be prohibited. Performance Guaranteed! CoatingsPro Spotlight 2013 Mascoat Industrial-DTI is a thermal insulating coating that can save companies money on energy and maintenance costs, and also prevents costly accidents. The coating prevents CUI and is able to save energy by reflecting it back into the product, not just dissipating it. The coating will also protect personnel per ASTM Standards C1055 and C1057. Applicable to substrates up to 375°F, the coating is spray-applied and allows for constant inspectability. Since the coating can be applied to working substrates in a fraction of the time of conventional insulation, installation and shutdown costs are kept to a minimum. g CoatingsPro Spotlight 2013 Paul N. Gardner Company, Inc. PolySpec/THIOKOL g Distributors, producers, and designers of quality physical testing and inspection instruments for the paint, coatings, and related industries. These include the automotive, aerospace, cosmetics, specialty chemical, petroleum, plastics, pharmaceutical, textiles, and food among others. Visit our website at www.gardco.com, which includes full descriptions, instructions, specifications, references, and prices. PolySpec/THIOKOL Phone: (281) 397-0033 • Fax: (281) 397-6512 www.polyspec.com Reader Inquiry #6227 Reader Inquiry #6228 July 2013 g www.coatingspromag.com 53 CoatingsPro Spotlight 2013 Paul N. Gardner Company, Inc. 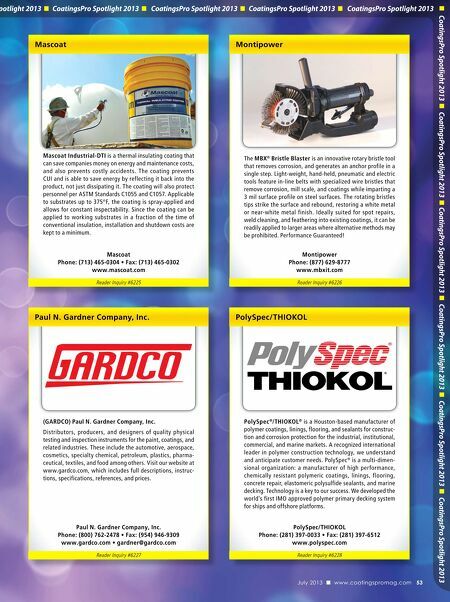 Phone: (800) 762-2478 • Fax: (954) 946-9309 www.gardco.com • gardner@gardco.com g PolySpec ®/THIOKOL® is a Houston-based manufacturer of polymer coatings, linings, flooring, and sealants for construction and corrosion protection for the industrial, institutional, commercial, and marine markets. A recognized international leader in polymer construction technology, we understand and anticipate customer needs. 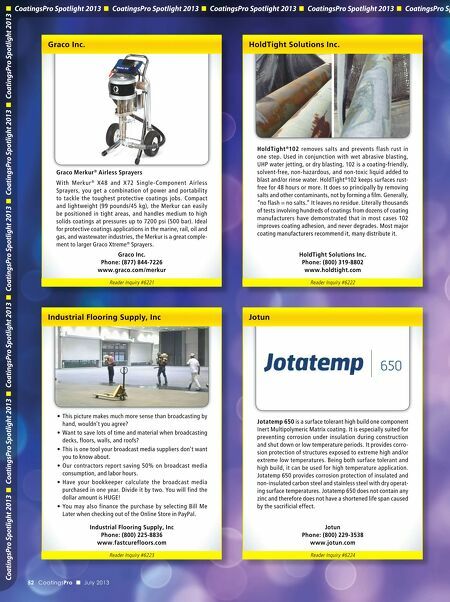 PolySpec ® is a multi-dimensional organization: a manufacturer of high performance, chemically resistant polymeric coatings, linings, flooring, concrete repair, elastomeric polysulfide sealants, and marine decking. Technology is a key to our success. We developed the world's first IMO approved polymer primary decking system for ships and offshore platforms. CoatingsPro Spotlight 2013 (GARDCO) Paul N. Gardner Company, Inc.